Hey there, Holly here from Revamperate again! Spring is creeping in, which means it’s finally time for all the best fruits. When I think of spring and summer, I think of cobblers, tarts and lots of ice cream and popsicles. 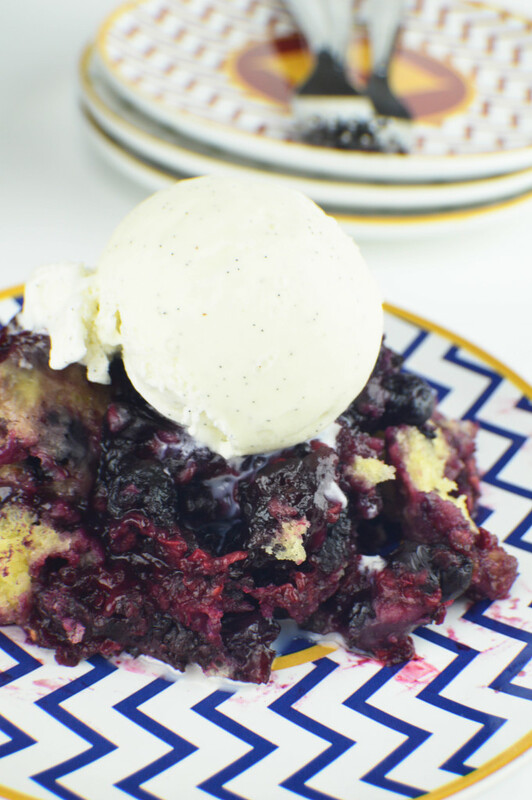 To make the easiest of all cobblers, you can make a super simple slow cooker cobbler with your favorite fruit and a really easy batter base. The great thing about baking this way is that it’s pretty low maintenance. Who doesn’t love a hands-off dessert? 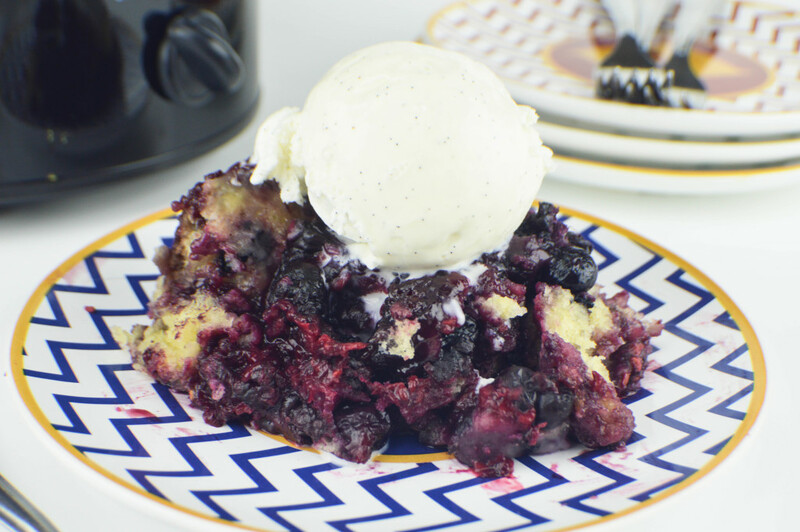 This recipe for slow cooker mixed berry cobbler has blueberries, raspberries and blackberries, but you could make this with any combination of fruit. It’s quick to whip and you just let it cook for a couple hours with little fuss. Another great thing about slow cooker desserts is the leniency of cook time. Because it doesn’t heat like an oven or stovetop, it’s OK if you leave it cooking for a bit longer and it won’t burn your cobbler. You can also adjust the amount of fruit if you want – this version has a higher fruit to batter ratio. If you have a stand mixer, fit it with a whisk attachment and combine the flour, sugar, salt and baking powder. In a separate bowl, whisk together the egg, vanilla, milk and oil. Add the egg mixture to the dry ingredients and mix until just combined. If not using a stand mixer, combine the dry ingredients in one bowl. In another, whisk together the egg, vanilla, milk and oil. Then add the egg mixture to the dry ingredients and mix by hand with a whisk. Spread the batter into the bottom of the greased slow cooker. First of all, I recommend using fresh berries so that they cook more evenly with the cobbler base, but if using frozen berries, let thaw at room temperature for about an hour if possible. I’ve tried it both ways, and I found that the frozen berries worked fine but took a bit longer to cook. In the same bowl (no need to wash in between), stir together the 2 tbsp of flour and ¾ cup of sugar. Toss in the berries and stir to evenly coat. Evenly pour the berries over the batter. Sprinkle the top with lemon juice. Cover the slow cooker and turn heat to LOW for about 2 1/2 hours (may be longer if using frozen berries). If you stick a fork into the batter portion and it doesn’t stick, you know the cobbler is done. It should be light and fluffy. Use a spoon or spatula to scoop the cobbler out and top with a scoop of vanilla ice cream (or yogurt), but I highly recommend the ice cream! For more of my recipes, head over to www.revamperate.com! I love that this recipe calls for few ingredients! Slow cooker recipes are naturally easy, but the prep. time can be a killer. This looks like a quick fix! I also like that won’t overcook and burn. Looks yummy! Thanks for sharing.